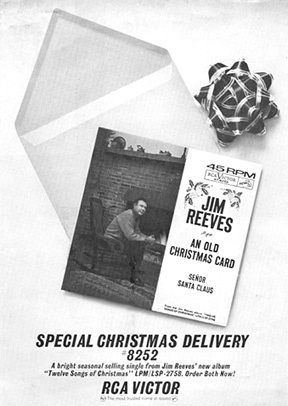 One of the best songs in Jim's Christmas album is "An Old Christmas Card." It was also released as a single during the holiday season in 1963, backed by Lawton Williams' "Senor Santa Claus." This is the full-page ad that appeared in the trade publications promoting the release. The sleeve of the single was in full color, and consisted of a picture that Mary later used (with different cropping) on the cover of the "Missing You" album years later.